If there’s three things England was known for prior to the current day, it was its Kings, religion, and churches. After all, King Henry VIII made his own church just so he could get a divorce from his first wife, Catherine of Aragon. 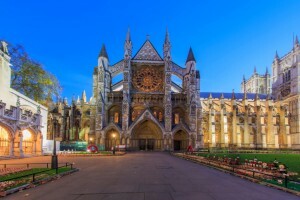 The famous, regal Westminster Abbey in London, England. So, it stands to reason that London has a bounty of beautiful, historical churches to check out. We’ll list some of the most famous London churches, not to be missed, below! Although it’s so well-preserved it wouldn’t seem quite so ancient, the famous Westminster Abbey was in full use by 1066, when William the Conqueror was crowned. Not only is the medieval architecture awe-inspiring, but several renowned people throughout history were buried there, such as: Mary Queen of Scots, Henry III, Elizabeth I, and poets Chaucer, Browning and Tennyson. While the original cathedral was actually built in 604, the current cathedral dates back to 1675 and is the work of the great British architect Sir Christopher Wren. It is only second in size to St Peter’s Cathedral in Rome! This is the cathedral where Princess Diana and Charles were married. Ever heard of the Order of the Knights Templar? If not, think of the famed knights who wore white with the red crosses. The name of this church was derived from this order, which dates back to 1118 and protected pilgrims. Originally built in the 12th century, it’s unfortunately not as well-preserved as other famous churches, and not much of the original architecture remains. The Templars remained in the church until King Henry VIII acquired it. Although these are some of the most well-known churches in London, there are many more with rich history to explore. There are also various medieval castles still standing today (and some barely standing), including the many residences of King Henry VIII and his various wives. These architectural feats are truly something to behold! Travel to England and see famous London churches in person! AESU offers several trips to England, including: Cosmopolitan, Euro Spree, Explorer, Euro Focus, Great Escape, and more. Explore Italy and its ancient architecture, plus see the famous London churches and explore the beautifully-preserved ruins! If you have any questions or want help booking your England adventure, please contact AESU by calling 800-638-7640, or fill out the contact form found on our website! This entry was posted on Thursday, February 18th, 2016	at 11:00 am	. You can follow any responses to this entry through the RSS 2.0	feed. Both comments and pings are currently closed.